Although Minamoto no Yoshitsune contributed greatly to the annihilation of the Heike clan, he was mistrusted by his brother, Minamoto no Yoritomo, and pursued. During his escape to the provinces west of Kyoto with his loyal followers, including Benkei, he arrives at the Daimotsu-no-ura Coast. His mistress, Shizuka, also accompanies them; however, it is difficult for a woman to follow along on such an arduous journey. Persuaded by Benkei, Yoshitsune decides have Shizuka return to Kyoto. At their farewell party, she is requested to perform her particularly skilful dance and then sees Yoshitsune off with tears. Benkei encourages Yoshitsune, who is reluctant to depart due to his sorrow in separating from Shizuka. He forcefully gives the command to set sail. As soon as their boat sails away to the ocean, a storm suddenly hits the boat. The ghosts of the member of the Heike clan Yoshitsune killed at Dan-no-ura (the coastal area in present Shimonoseki City in Yamaguchi Prefecture), appear on the waves. 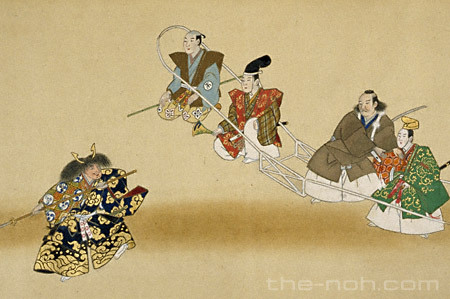 Especially the vengeful ghost of Taira no Tomomori, who was the top general of the Heike clan, fiercely attacks Yoshitsune with his long-handled sword, making every effort to send Yoshitsune to the depths of the sea. Benkei rubs his Buddhist prayer beads and devotedly prays to the five great fierce deities. As the deities accept his prayer, at dawn the ghosts of the Heike clan are subdued and disappear below the horizon. This noh drama is easy to understand with involvement of popular characters, Yoshitsune, Benkei, and Lady Shizuka. 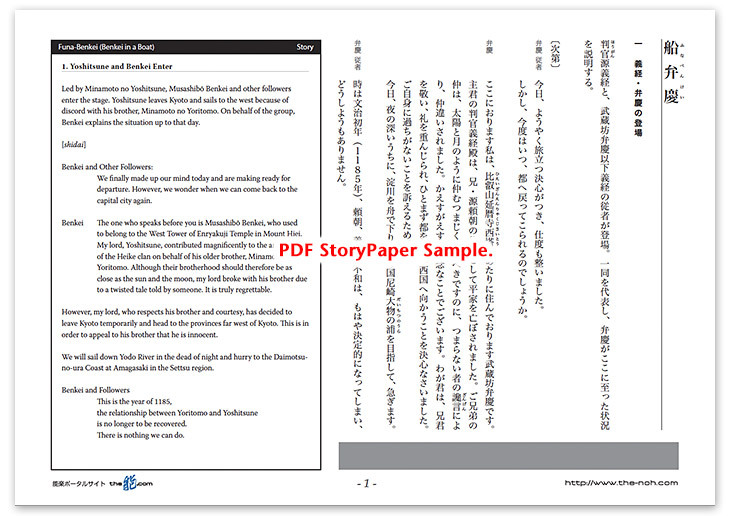 Centered on Benkei, the story progresses at a good pace. In this drama, an actor plays both mae-shite(first half lead part), a beautiful shirabyōshi (a female dancer dressed as a man), and nochi-shite（second half lead part）, a monstrous vengeful spirit, which are totally different characters. In maeba (first half of the drama), the actor is required to dance, while in nochiba(second half of the drama), he has to dance while wielding a long-handled sword. In these two scenes he must show entirely different qualities in the utai and his movements. Also, in this drama, the scenes changes from one at an inn on the Daimotsu-no-ura Coast to one on the sea. The drama expresses the shift with only a boat that is a small stage property. This is the scene where a boatman, performed by ai-kyogen, can show his performance skills. Through his conversations with waki and his skilful navigation with a pole in the storm, the audience can enjoy the performance just as if they are watching a real stormy sea.